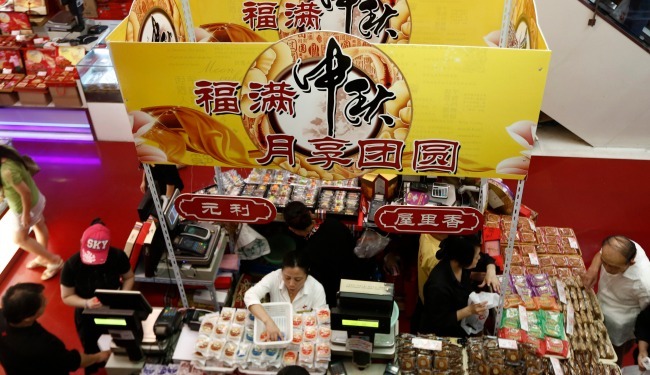 What a traditional snack—and its packaging—tells us about China's economy and society. China's annual mid-Autumn festival, a celebration of the fall harvest, was held today, and all throughout the country people celebrated by eating mooncakes. For the uninitiated, mooncakes are small, hockey-puck sized snacks that can be savory or sweet and usually come adorned with decorations, words, or even off-color imagery. As central to the mid-Autumn festival as turkey is to Thanksgiving, mooncakes are found everywhere in China and are even sold in McDonald's and Starbucks. But what's interesting about mooncakes aren't the treats themselves: it's their packaging. Typically, a Chinese family buys mooncakes in bulk, serving treats wrapped in bland, ordinary packages. But over the years a market has developed in China for elegantly-wrapped mooncakes for use as a form of currency in gift exchanges and, often, bribery. Mooncake packaging can be so elaborate that it even becomes a larger component price than the cakes themselves. 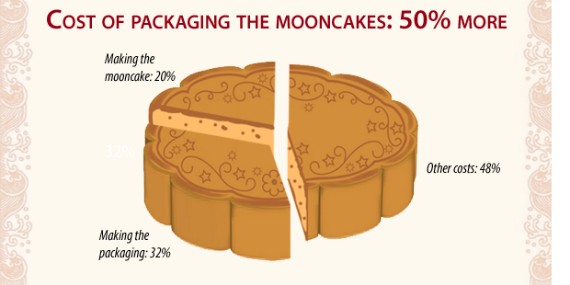 But, like most packages, mooncake wrappers are discarded and forgotten after the cake is consumed, which, considering China's huge population and the ubiquity of mooncakes this time of year, understandably translates into a lot of waste. But the exact number is still staggering. 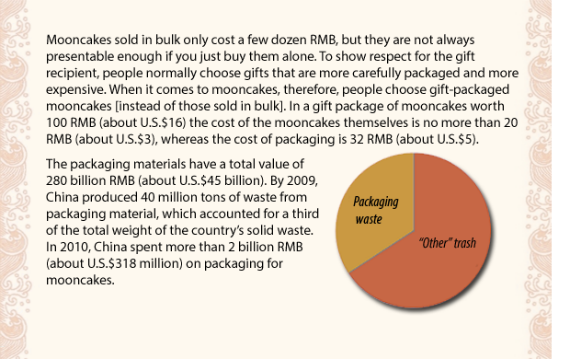 This fascinating infographic, published by ChinaFile in collaboration with Sohu Business and Tea Leaf Nation, shows that mooncake packaging accounts for $2 billion RMB (about $318 million) in packaging costs, the latter forming a significant chunk of China's 40 million tons of waste. Waste is also an issue with the mooncakes themselves: Last year, Hong Kongers alone threw out 2 million of the snacks. (That's out of a total population of just over 7 million, to give you an idea of just how popular mooncakes are—and of how high the number of wasted mooncakes on the mainland must be). Then there's the usual problem of food safety: Shanghaiist reported that an excessive amount of plasticizer was found in a sample of mooncakes in Guangzhou, raising concerns that consumption may lead to food-borne illness or other health concerns. Given their importance to Chinese culture—Mid-Autumn Day is unthinkable without them—mooncakes aren't going anywhere. But the intricately packaged, expensive variants have run smack into Xi Jinping's “austerity” drive, a movement to remove ostentatious symbols of greed and corruption. Beijing has banned the use of public money in purchasing mooncakes, which has affected sales nationwide. Whether Xi's reforms will make a difference within Chinese society is open to debate—but even a modest reduction in mooncakes will greatly lessen China's environmental footprint.